Ron Smith was born on November 10, 1943, in Jacksonville, Florida. He was commissioned a 2d Lt in the U.S. Air Force through the Air Force ROTC program on December 18, 1965, and went on active duty beginning March 14, 1966. Lt Smith next completed Undergraduate Pilot Training and was awarded his pilot wings at Williams AFB, Arizona, in March 1967, followed by Pilot Instructor Training at Williams AFB from March to May 1967. His first assignment was as a T-38 Talon Instructor Pilot with the 3525th Pilot Training Squadron at Williams AFB from June 1967 to March 1971. He then attended A-1 Skyraider Combat Crew Training before serving as an A-1 pilot with the 1st Special Operations Squadron at Nakhon Phanom Royal Thai AFB, Thailand, from August 1971 to August 1972. After returning to the United States, Capt Smith received an Air Force Institute of Technology assignment to complete his Masters Degree in Systems Analysis at Wright-Patterson AFB, Ohio, from August 1972 to March 1974, followed by service as an Operational Research Officer and Personnel Systems Analyst with the Air Force Military Personnel Center at Randolph AFB, Texas, from April 1974 to January 1977. He attended the Armed Forces Staff College at Norfolk, Virginia, from January to October 1977, and then served as an A-10 Thunderbolt II pilot with the 356th Tactical Fighter Squadron at Myrtle Beach AFB, South Carolina, from October 1977 to July 1978. LtCol Smith next served as Chief of Stan/Eval with the 354th Tactical Fighter Wing at Myrtle Beach AFB from July 1978 to November 1980, followed by service as Operations Officer for the 353rd Tactical Fighter Squadron at Myrtle Beach from November 1980 to February 1981. He then served as an A-10 pilot and Commander of the 75th Tactical Fighter Squadron at England AFB, Louisiana, from March to November 1981. Col Smith served as Chief of Inspections with the 23rd Tactical Fighter Wing at England AFB from November 1981 to August 1982, and then served as Chief of the Surface Attack Study Group and then Chief of the Fighter Division in the Office of the Assistant Chief of Staff for Studies and Analyses with Headquarters U.S. Air Force in the Pentagon from August 1982 to July 1984. 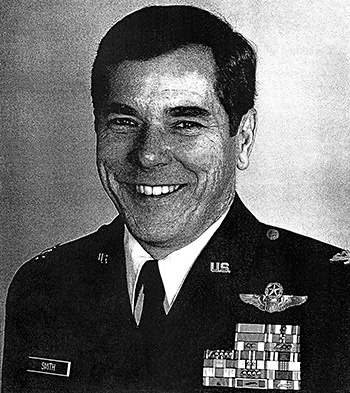 He next attended the Industrial College of the Armed Forces at Fort McNair, Washington, D.C., from July 1984 to June 1985, followed by service as Director of Assignments in the Office of the Deputy Chief of Staff for Personnel with Headquarters U.S. Air Forces in Europe at Ramstein AB, West Germany, from June 1985 to June 1987. Col Smith's final assignment was as Base Commander of Williams AFB, Arizona, from August 1987 until his retirement from the Air Force on August 1, 1989. The President of the United States of America, authorized by Section 8742, Title 10, United States Code, awards the Air Force Cross to Captain Ronald E. Smith for extraordinary heroism in military operations against an opposing armed force as an A-1 Tactical Fighter Pilot in Southeast Asia from 1 June 1972 to 2 June 1972. During this period, Captain Smith was the on0scene commander for an extremely hazardous and complex search and rescue mission to recover an American crew member in the heavily fortified Red River Valley. In his efforts to locate the survivor, Captain Smith deliberately and repeatedly exposed his slow-moving aircraft to intense antiaircraft fire to mark and pinpoint the survivor's location. After directing air strikes to silence the threatening hostile forces, he led the vulnerable rescue helicopter to a safe and successful recovery of the downed crew member. Through his extraordinary heroism, superb airmanship, and aggressiveness in the face of the enemy, Captain Smith reflected the highest credit upon himself and the United States Air Force.